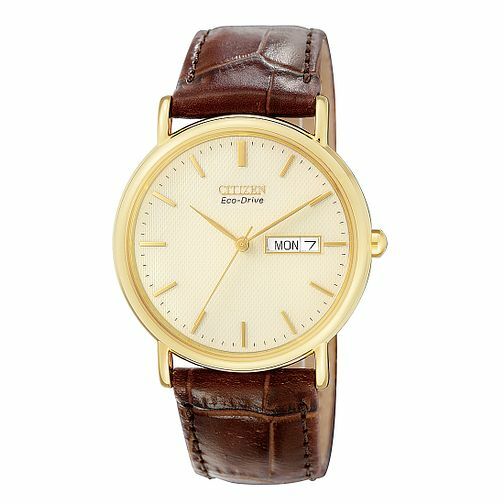 A classic men's gold-plated, brown leather strap watch from Citizen. Featuring the Citizen Eco-Drive system to keep your watch powered up from any light source. Citizen Men's Gold-Plated eco-Drive Watch is rated 4.7 out of 5 by 3. Rated 5 out of 5 by Anonymous from Dad christmas present My dad was thrilled with this watch as I tried to get his old one fixed but parts were obsolete. Rated 5 out of 5 by Anonymous from nice watch Good looking watch, nice to where, Eco-Drive perfect no battery's to worry about.